Tumbler screen is an efficient sieving machine which is designed to meet the large output,, which takes the most effective simulation of the artificial sieving movement (sieving precision, efficiency, sieve life is 5-10 times than usual sieving machine).Tumbler screens are suitable for all powders and granular materials in the fine and ultra fine range , especially for materials which are difficult to sieve. Up to 5 times output per unit area; accurate to 6 Level separation, sieving efficiency is as high as 90% -95%; when using the silicone rubber balls, ultrasonic and other high-performance mesh-cleaning device system, the mesh hole will not be blocked. 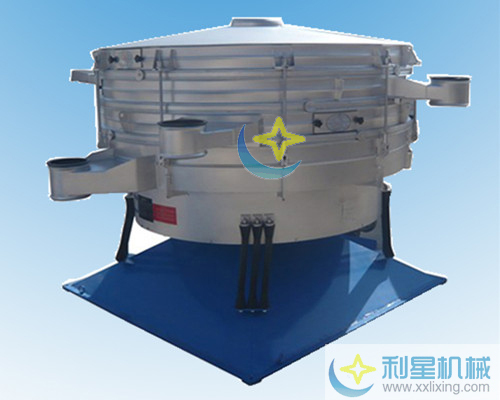 whole sealing structure design, safety operation; the acceleration is 4.5 times lower than vibrating sieve, sieving parts’ increases the life expectancy and reduces maintenance; noise<75 dB. Re-optimization is balanced, ground-based dynamic load is low. l Each product’ dwell time can be adjusted in a radial and tangential angle ,towards the drive axis. l The horizontal and vertical acceleration are increased with the movement of the particles, and then the particles which are close to mesh size will be successfully separated; The larger particles are transported to the exit, the flow can be controlled by a regulated oriented device at the exit, the oriented device is another factor which controls the dwell time of the materials. l The process is repeated in each layer.